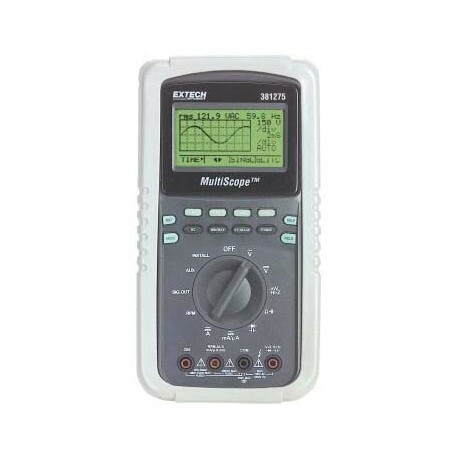 The HANDHELD MULTISCOPE is a graphical storage oscilloscope and true RMS DMM that that includes an RS-232 interface and PC software. It features oscilloscope graphical functions: single channel, volts/division (150mV-400V), amps/division (15A), 500ns glitch capture, and pre/post-trigger (-4div/+10div). The oscilloscope bandwidth is DC to 100kHz with a sample rate of 1,000,000 samples/second. The multimeter functions include AC/DC voltage/current, resistance, capacitance, frequency, dB, duty cycle, pulse width, period, TTL level generator, and diode and continuity tests.